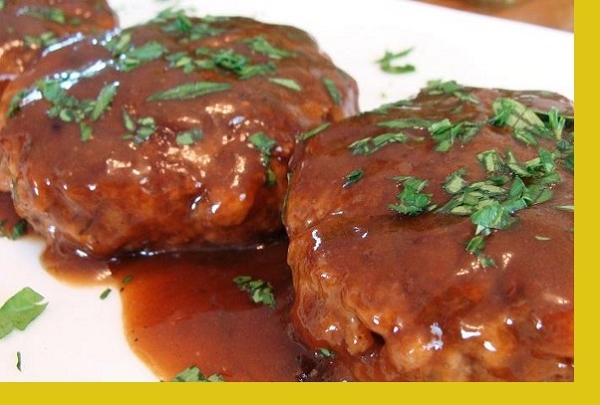 This is an American classic beef patty that's topped with a "french onion" gravy and served with mashed potatoes. Quick, easy and delicious! 1. Dredge both sides of the patties with flour. 1. Coat a pan with oil and heat on medium high heat. 2. Saute beef patties 3 minutes per side.3. Discard excess oil. Add sauce to pan, bring to boil then reduce heat to medium low, cover and simmer for 10 minutes. This is so easy and the gravy is delicious! Ordered Salisbury Steak & the party was delicious & a good size. There was plenty of onion sauce to cover the meat & potatoes. I was surprised the directions said to cover with flour first. I had never done that before but the results were delicious. 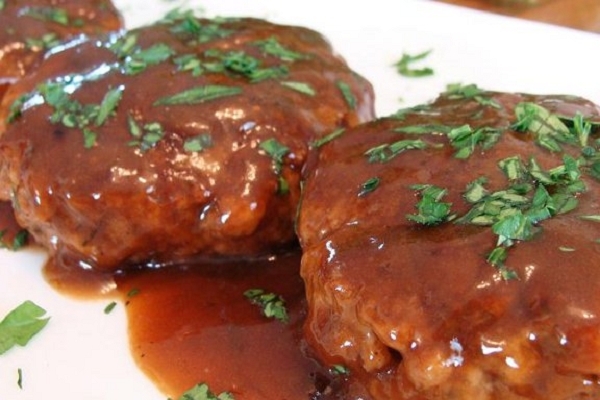 This Salisbury Steak dish has become one of our favorites! Quick and delicious. Thanks, Maria! This is a classic dish for people who like their meat, potato and gravy meal. Very flavorful & plenty of gravy to smother the beef patties & mashed potatoes. Delicious!! The Salisbury Steak was so delicious & moist. Along with the sauce & potatoes it was a very enjoyable meal. Glad we ordered. This meal of Salisbury steak and mashed potatoes was delicious. Quick and easy to prepare. I also prepared a quick veggie to accompany the meal. Wonderful flavor in the sauce! This is a do again meal. Very tasty and my kids loved it! Another great family option from Maria! This dish is our favorite! It is so flavorful and easy to prepare. The potatoes that come as side dish help make this an easy meal to put together. Another great meal by Maria!! We have yet to order something that my family doesn't like. Medium difficulty to prepare the meat (just because searing in oil seems to still get me especially since I'm trying to learn to stop splashing hot oil on myself), but the flavor is incredible. Worth every minute and splatter. This was the best salisbury steak I have ever had. The gravy was light not heavy light others that I have had. The meat was flavorful and the mashed potatoes were yummy. Kept snacking on those while the meat finished cooking. The sauce and meat were both fantastic! I love the ease of making Maria's "homemade" meals in our home! Thank you for a great service to your community! Just the right seasonings in the meat to make these taste so good.